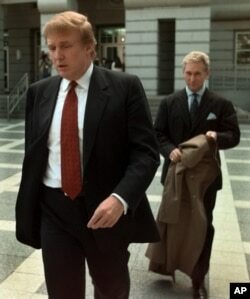 FILE - Billionaire real estate developer Donald Trump, left, walks to the Federal Courthouse in Newark, N.J., with Roger Stone, the director of Trump's presidential exploratory committee, Oct. 25, 1999, for the swearing-in of Trump's sister as a federal appeals court judge. Chairman of the National Legal and Policy Center, Peter Flaherty, speaks to media as he leaves federal court in Washington, Nov. 8, 2018. 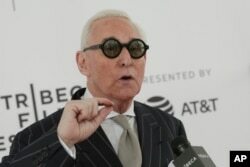 FILE - Political consultant Roger Stone attends a screening of "Get Me Roger Stone" at the SVA Theatre during the 2017 Tribeca Film Festival.